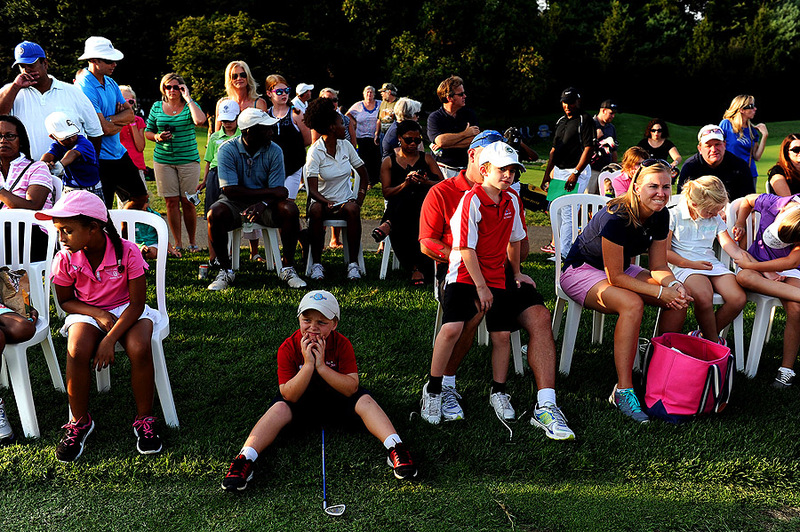 "Brady McCarthy waits for the boys and girls 7-9 group winners to be announced during the Middle Atlantic Regional round of The Drive, Chip and Putt Championship at River Bend Golf and Country Club on August 26, 2013 in Great Falls, Virginia." Growing up an athlete, I was always taught not to say your weakness. I do have one though - it's golf. I'm a terrible golfer. I have zero patience and will never play again. Conversely, that doesn't mean I don't enjoy watching the sport or photographing it. I recently had the opportunity to document the Middle Atlantic Regional round of The Drive, Chip and Putt Championship at River Bend Golf and Country Club in Virginia. Talk about talent, any one of these youth golfers could easily destroy me on a course. From long drives to precise putts, I was simply blown away by their skills at such a young age. The entire event was in a close radius and made it a challenge to find different angles, while still providing the needed imagery for the client. A long day in the sun, I had blast documenting these golfers challenge one another for the chance to win an all-expenses paid trip to Augusta National. It's always fun to see youth being taught about competition, the peaks and valleys that come with it, and perfecting their talents. Congratulations to those that get to move on to Augusta next year - just don't invite me to play a round in your flight. i really enjoyed looking at this. nice set.